The Houston Livestock Show and Rodeo wrangles HD. 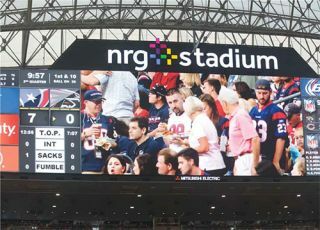 Images at NRG Stadium capture the excitement of a 2014 NFL football game between the Houston Texans and the Atlanta Falcons. The annual Houston Livestock Show and Rodeo—a.k.a. RodeoHouston— is the world’s largest livestock and rodeo show. Even by Texas standards, this show is big: Nearly 1.4 million people attended this three-week event in March 2014. With crowds this big turning out to see the livestock shows and world-class rodeos, RodeoHouston needs a big home. That’s why it has been located at the city’s NRG Center and NRG Stadium since they opened in 2002. The NRG Center is a convention facility that covers a total of 1.4 million square feet. NRG Stadium (the erstwhile Reliant Stadium) is the world’s only rodeo and NFL indoor/outdoor retractable roof, natural grass stadium. This original system worked well in the analog 4:3 aspect ratio days. But once HDTV came along and caught on, RodeoHouston knew they needed to upgrade their in-house CCTV network. So they called on BTS Houston in 2011, and BTS Houston devised a modern, analog/digital hybrid head end solution. The priority for RodeoHouston was not just to modernize its in-house CCTV system, but to ensure that the new version remained impervious to external RF interference. BTS Houston was pleased to recommend Contemporary Research (CR) QMOD modulators on RodeoHouston’s behalf, and not just because this integrator is a CR dealer. “We were able to modulate each digital TV channel using a single CR modulator for about $2,500-$3,000 each,” said McKee. “In the original plant, they had just one HD channel, and the equipment to put this single channel on the system had cost $70,000.” As well, because the CR QMOD modulators are passing digital signals, there was no need to add bandpass filters to reject harmonics from modulator output. This too was another cost savings for RodeoHouston. Looking ahead, Bill McKee is anticipating Contemporary Research coming up with new QMOD modulators that can accept HDMI inputs. “This would help us keep up with technological change, and increase the number of input sources that we can choose from,” he said. RodeoHouston’s James Davidson is even more to the point: “We are very happy with Contemporary Research products and feel they are an excellent value,” he said. In the rough-and-tumble world of world-class rodeo, having products that you can rely makes all the difference, especially when you are serving an annual market of 1.4 million attendees. Ottawa-based James Careless is a regular contributor to AV Technology magazine.